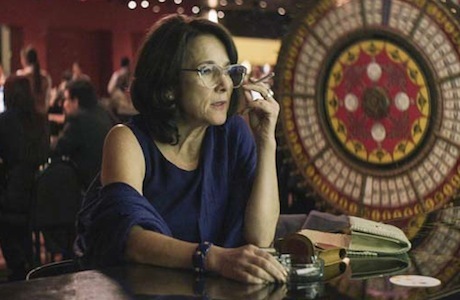 Gloria (Paulina García), a divorced woman with two independent adult children, lives alone in Santiago, Chile, working during the day and clubbing at night. Though free-spirited and independent, in the sense that she doesn't conform to the social expectations of a woman on the cusp of becoming a grandmother, there are loneliness, fear and a slight sense of repression. It's something observed during the quiet moments, when she tenuously sings along to songs on the radio, murmuring the occasional word and bopping her head, hesitant to belt out the chorus unashamedly. Sebastián Lelio's sexually frank character drama examines the nature of independence and reclaiming one's life, post-heteronormative performance. Gloria, quick to usher out a neighbour's cat that perpetually finds its way into her home — perhaps hinting at the presumed life of a post-menopausal woman — finds liberation through youthful antics, drawing on lipstick and dancing at a local singles club. When not visiting with her son and daughter, she's ostensibly looking for another man to define, and shape, her life. Early on in Gloria, our observant, but agreeable protagonist meets former naval officer — now a paintball and bungee swing emporium owner — Rodolfo (Sergio Hernández) at a club, striking up a very vivid sexual affair, despite not being confident that his assertions of finalizing a divorce a year prior are true. He receives calls hourly from his daughters, who he claims are entirely dependent on him, both financially and emotionally. Gloria, keen to move onto the next chapter of her life with a partner in crime, is resentful of his tendency to acquiesce to the demands of his ex-wife and children, having raised two capable kids of her own. Very little actually happens throughout this astute examination of middle age. Many scenes drag on, featuring Gloria dancing, humming along to a tune or engaging in vague political banter at dinner parties, doing little to define or propel the narrative. We're meant to observe and understand this woman as she comes to understand herself. Though she's initially quite strong and assertive, kicking Rodolfo to the curb when he sneaks out of a familial social gathering without telling her, she eventually lets him back in, consistently vacillating between confidence and reckless, transparent neediness. As smartly realized by Paulina García, Gloria is an unlikely, fascinatingly contradictory subject, one afraid to lose control — she won't smoke pot socially, but is happy to light up when she finds her emotionally unstable neighbour's lost stash — while routinely dabbling with just that. Gloria winds up being about establishing boundaries with the self, in relation to social conditioning and identity performance, which, once all is said and done, is as empowering as it is obvious and redundant. Though minor and occasionally lethargic in execution, there are subtlety and a quiet observation of human inconsistency that aren't often captured with such a natural ease, which in itself is quite an achievement.